This post was updated in 2018 with the new Bramble Berry Lye Calculator design. The search for the perfect cold process soap recipe is both fun and a little daunting. There are so many different factors to consider, including the ingredients, the method, and the type of mold. One factor you shouldn’t feel limited by is the size of the recipe. No matter how much the recipe makes, you can resize it to fit whatever mold you have. Resizing a recipe does require a little bit of math, but once you understand the basics of the Lye Calculator, it’s super simple. The first thing to understand about cold process recipes is the difference between the oil weight and the total yield. A cold process recipe is made of oils, a liquid like water, and sodium hydroxide lye. Those three components create the total yield of a recipe. For example, the 10″ Silicone Loaf Mold holds about 50 ounces, so the total yield of the recipe should be about 50 ounces. The total oil weight will be less than that because it doesn’t take into consideration the water and lye, which will add several more ounces to the recipe. If the recipe doesn’t tell you the total yield of the recipe, you can add up the oils, lye, and liquid to find it. 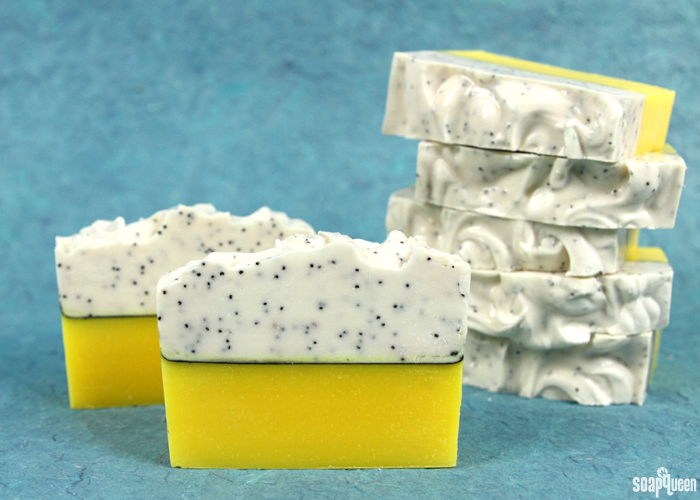 Let’s look at the Lemon Poppy Seed Cold Process Soap as an example. It’s a simple recipe made with coconut oil, olive oil, palm oil, and rice bran oil. Combined, the total oil weight of this recipe is 33 ounces. To find the total yield of this recipe, add the sodium hydroxide and distilled water. That gives you 48.6 ounces. Now, let’s say you love this recipe so much that you want to make it in the 5 Pound Mold with Sliding Bottom. That mold holds 5 pounds of soap, which is equivalent to 80 ounces. The easiest way to resize the recipe is with the Lye Calculator. If you’ve never used it before, check out the Using the Bramble Berry Lye Calculator post to learn the basics. To resize the Lemon Poppy Seed Cold Process recipe, select the type of soap, the unit of measurement, and the superfat level on the calculator. We chose a 5% superfat, but you can change that if you like. Hit “Next” and then enter your oil amounts. Click “Next” at the bottom of the calculator. See the results below. Now it’s time to resize it. See the section at the bottom that says “Resize Batch?” Click that button and enter your oil weight and unit of measurement and then click “Adjust Batch.” Currently, the oil weight for this recipe is 33 ounces. Choosing a new oil weight is a little bit of a guessing game at first. We know we want the total yield of the recipe to be about 80 ounces, but we don’t know what the exact oil weight should be. That’s okay, because you can resize the batch as many times as necessary. We’re going to guess and input 50 ounces, then click “Adjust Batch.” You can see the new recipe below. With an oil weight of 50 ounces, the new total yield is 73.61 ounces. That’s closer to 80 ounces, but not quite there – time to resize the batch again. This time, we entered 55 ounces for the oil weight and the total yield was 80.97 ounces. We also tried 54 ounces, which gave us a total yield of 79.5 ounces. Either amount would be fine, but we prefer having a little bit of extra soap just in case. You’ll notice that in all of these recipes, the ratio of oils stays the same. Once the recipe is resized, keep in mind the fragrance oils, colorants, and other additives will also need to be resized. 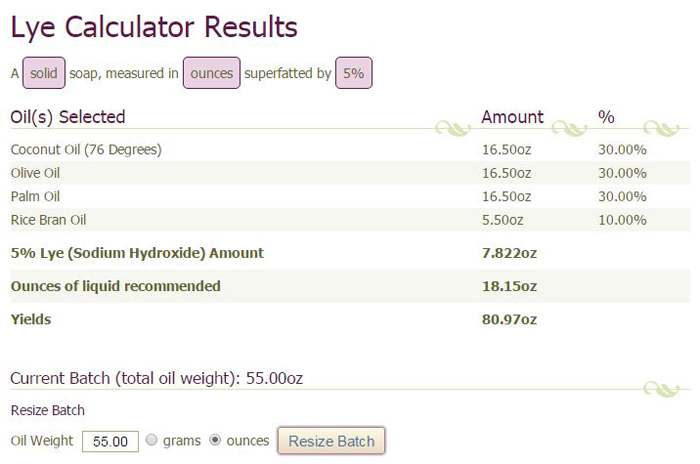 The Fragrance Calculator makes it easy to find out how much scent is safe to use in the recipe. You can adjust the amount depending on personal preference. The Lemon Poppy Seed Cold Process recipe uses a blend of Champagne and Lemon Verbena Yankee Type Fragrance Oil. The blend uses two parts Champagne to one part Lemon Verbena. When resizing, keep the ratio of the blend the same for a similar scent. Remember soaping is all about personal preference, so feel free to experiment and change blends depending on what you love. Check out the Fragrance Oil Blending Tips post for more information on creating your own blends. Check out the Fragrance Oil Blending Tips post to learn more about creating your own blends. If you aren’t resizing the recipe in an even amount (halving, doubling, tripling, etc. ), it can be tricky to figure out how much colorant you’ll need. 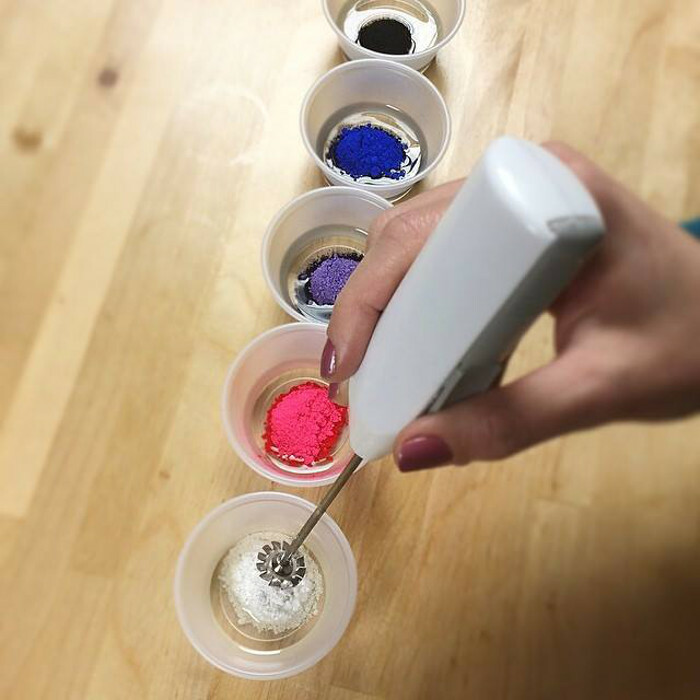 We generally recommend preparing extra colorant so you know you’ll have enough. That way you won’t have to prepare more during the soapmaking process. You can store any leftovers in an airtight container in a cool, dry place. They will have the same shelf life as the oil they’re dispersed in. 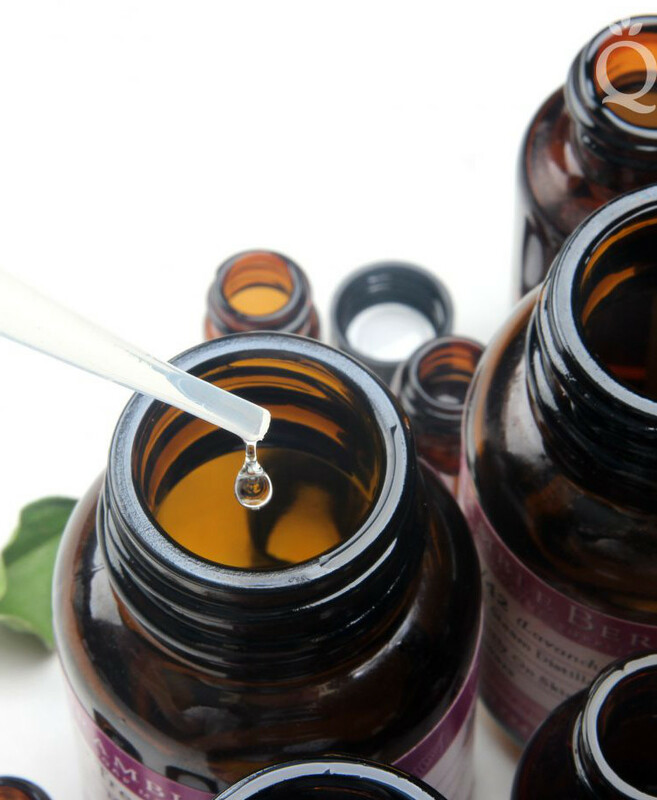 Learn more about the shelf life of oils here. Just make sure to mix well before using, as the colorants will settle. For information on how to disperse colorants, check out this video on Soap Queen TV. You may also find the How to Get Vibrant Colors in Soap post helpful. We always like to disperse extra colorant just in case. Hi, I’m a newbie soap maker and found this site the best to learn! I’m wondering though, I’ve seen recipes with carrot juice/ purée or aloe vera pulp etc and would like to know, do I include this to the water content or oil content? When you are adding things like purees you don’t want to consider it part of the water but you do want to do a water discount. Normally up to 15% is normal, since the puree adds water as well. Can I substitute 92 degree coconut oil in your recipe above? The lye calculator comes out the same for both 76 degree and 92 degree. I like harder bars of soap and make them for our personal use at home. I don’t live in a warmer climate, but just like the harder bars for some reason. My husband says my bars last longer than bars I buy at craft shows. Is that only because of the 92 degree coconut oil? All of the recipes I look at seem to use the 76 degree, and I’m wondering what your recommendations are for using the 92 degree oil? Yes, you can use the 92F coconut oil for your recipes. It’s a good option for warm markets because of its higher melting point. You can use it the same way as 76F coconut oil, just make sure to keep the temperatures around 110-130F so it stays melted. 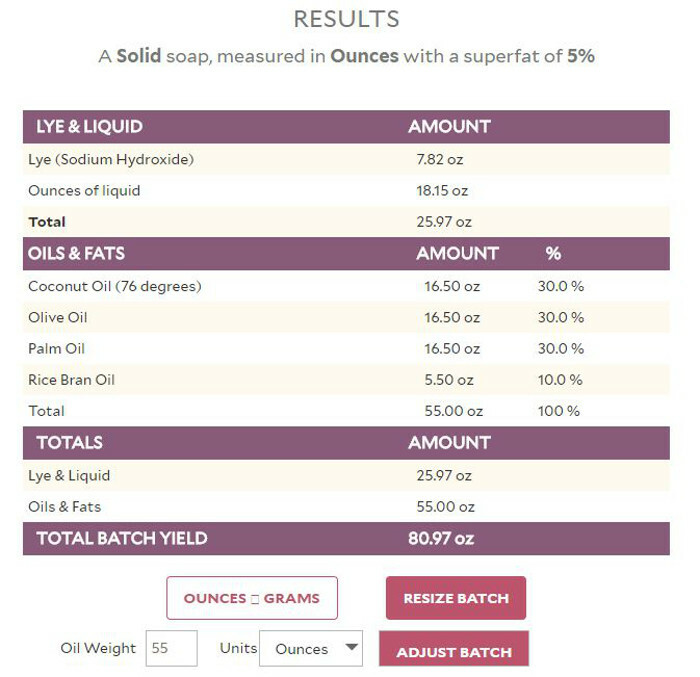 Just getting started with learning the math to making soap (or changes to recipes) so this may be a silly question – if you want to cut a recipe in half or double it do you need to run it through the lye calculator or will the lye simply be doubled or halved? You can just double or halve that recipe. It never hurts to run it through the Lye Calculator to double check your math though – I like to do that just in case. This is a super teacher to learn soapmaking.everything u want to teach go ahead here. Thank you, glad you’re enjoying the blog. I’m just getting started making soap so have been reading everything I can find about that. I especially like everything you’ve got posted here so have a request/comment for you to consider. Would it be possible for you to add a way for people to be about to print out your individual posts without having to copy them to a word processor, then print them out? I’m thinking something along the lines of what you see on many cooking recipe sites. They have a button you can click so you can print the entire recipe neatly on a sheet of paper without having to do the cut/paste thing. Just select “Print” and it will give you the recipe so you don’t have to copy and paste. 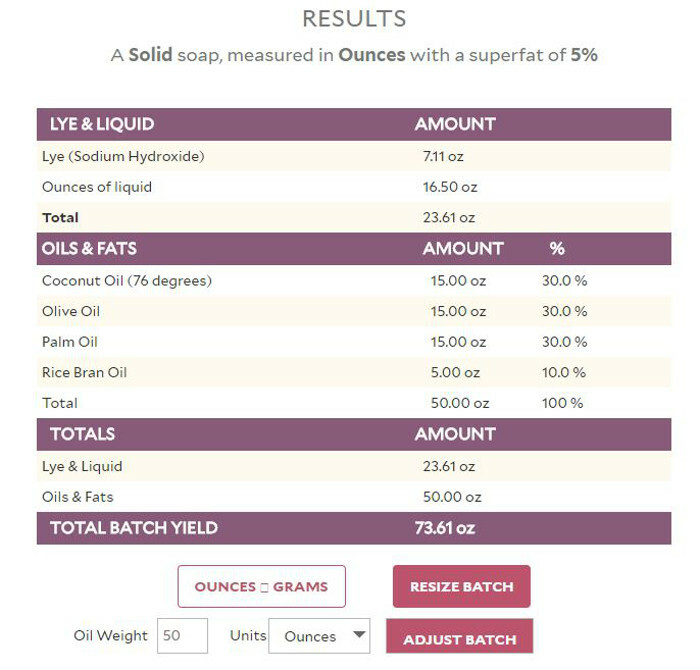 I have a question about 100% olive oil soap. 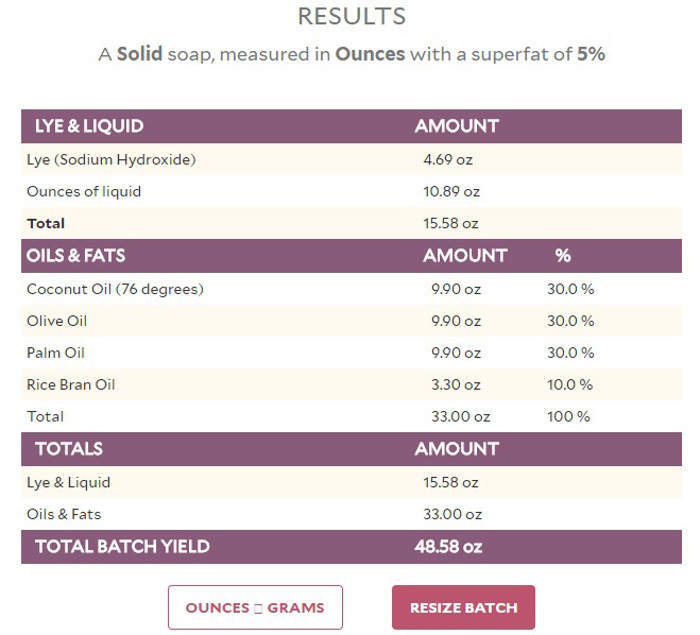 When I calculate the soap characteristics with soapcalc.net, it does not meet all requirements (e.g. ‘0’ on cleasing), although I read that 100% olive oil makes a good soap. Is this outcome of soap calc not correct? Castile soap will be less cleansing than bars made with oils like coconut and castor. However, it is very gentle and moisturizing, which is good for sensitive skin. You’re welcome Marion, thanks for your sweet comment. We generally don’t recommend adding extra oil to the melt and pour bases because it can affect the final texture and inhibit lather. You may try adding less in your next recipe (1 teaspoon) or leaving it out altogether. 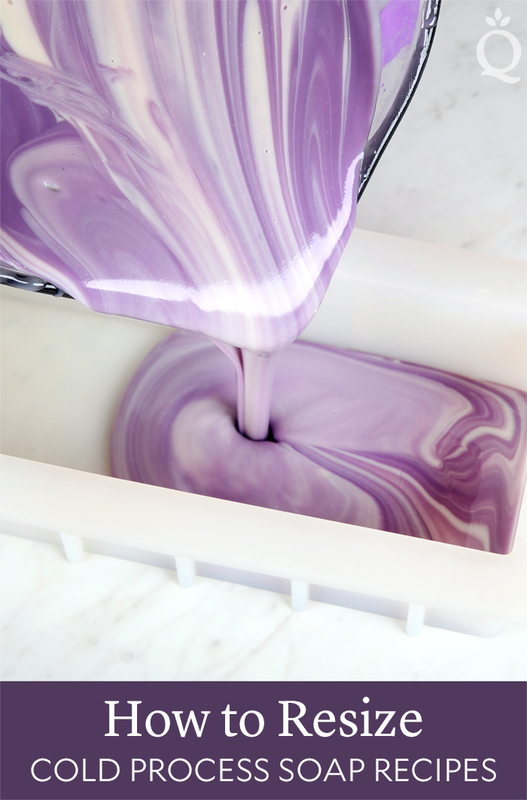 When mixing your colorants, are you subtracting oil from your recipe to mix them? You mention you make extra and store it when you have extra, so I wasn’t sure where to factor in colorant oil “extras”. Thanks! Good question. We do not subtract oil from out recipe when adding colorants. It’s true that you are adding extra oil to the recipe, but it’s generally a very small amount and not enough to affect your recipe. We like to think of those oils as a little bit of an extra superfat. If you are adding a lot of color, you can lower the superfat percentage to take this into account. Another option would be to create a more concentrated colorant dispersion (2 teaspoons colorant to 1 tablespoon oil, for example) to add less extra oil to the recipe, while still adding plenty of color. I just got a new mold made, and it’s huge. I think it will hold four of my old loafs, which means that I am guessing (kep word: guessing) that it will yield about 176 ounces of total finished soap after curing…but that’s just a guess. If you have any tricks, I would appreciate them. In the example above, which was great, you already knew that your mold held 5 pounds of soap, 80oz. If I’m not sure, it’s a lot of product to waste to guess, and get it wrong! Any other tips for figuring out the real total? Can you point me in the direction of a hot process crock pot recioe using the Lots of Lather soap mix for a 10″ silicone loaf mold? Thank you kindly, in advance. Can regular tapioca flour/starch (such as that used for Gluten free baking) be used in the Whipped Champagne Shea Butter in place of the tapioca powder? I must have missed this question. I am sorry about the delayed response. When we’re weighing ingredients, we like to pop a container on the scale and then hit “Tare” or “Zero.” That will zero out the scale, and you can pour your oils in. After every oil, hit tare again so it goes back to zero. We found that’s the easiest way for us! If your scale doesn’t has a tare button, I would recommend writing down the weight of your container, that way you can subtract as you go. For instance, if your container weighs 10 ounces and you’re adding 10 ounces of coconut oil, it will show 20 ounces on the scale. where do ya ll get those tiny mixers for mixing Mica? Both of those recipes sounds great I think I’ll try the one that dawnia first suggested, the whipped avocado sounds luxurious. I don’t really have any tricks, I just use the BB lye calculator which is so great and handy. I’ve used the calculator to make myself a spreadsheet for my favorite go-to recipes measured in batches of 1 to 5 pounds. That way I have one paper with all my measurement info on it for a number of recipes, for easy use and access when I’m planning a project. Hi bramble berry happy early thanksgiving!! Well it’s starting to get REALLY cold here, it’s been about 34 degrees over the weekend and I’m looking for a good hand cream. My hands get so dried out so fast when winter weather hits, so I came here to find a good healing hand cream recipe. Which recipe would be perfect for healing and protection? I have the same problem, even tho I live in Florida! Sometimes we go North in the Winter, and I have found that Soapqueens Whipped Avocado Body Butter is so much more moisturizing than a lotion. It really soaks in, and doesn’t take much! Good Luck! !